Since the start of gaming, wireless controllers have existed for nearly every console out there, and the quality of these pads was mixed. You ended up either with controllers that where cheaply made, had awful range, or one that did not work at all out of the box. However, in 1994, Sega released the best wireless pads on the market until the Nintendo released their Wavebird for the GameCube. 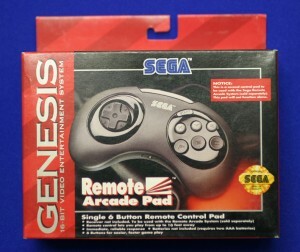 Sadly, very few people know that Sega released wireless pads for the Genesis and six button pads at that! Looking at the Accessory and Peripheral Guide here on Sega-16, I found out about the Remote Arcade System and my interest was piqued. The Remote Arcade System comes with a receiver and two six-button wireless pads. Fortunately, if you purchase a used set and only get one controller, you are not going to be denied wireless bliss. The controllers have a switch on them that allows you to set it to one or two players. Additionally, there is a switch on the receiver that allows it to pick up one pad or two, so keep that in mind if you get a set of controllers and it appears that only one works at first. Nevertheless, if you only get one pad and a receiver, good luck on finding a second pad, as it might have been lost or thrown out. Some decent scouring may yield you some decent results. For example, I was lucky enough to find one locally a week after I got my first one! Now the question is: are these pads any good? Does a bear poop in the woods? Yes! These pads are great. I have tried them with various games, such as Columns, Streets of Rage 2, Thunder Force III, and Sonic The Hedgehog, and there is no noticeable lag. They work fine with every Genesis system, even the Genesis 3! They’re a bit bigger than the stock wired six-button pads, and the start button is right above the X and Y buttons, so there is some difference, but the placement of the start button on the pads doesn’t take any effort to get used to. However, as great as they are, the Remote pads are relatively meticulous about facing the receiver (line-of-sight), so you might have to sit right in front of the system. I have not had these controllers long, so I cannot comment on battery life. Nevertheless, after a little over a week of intense play, I can safely estimate the battery life at around ten hours on two AAA batteries (per pad). The range is good: around ten to fifteen feet, which is decent in a big gaming room like mine. 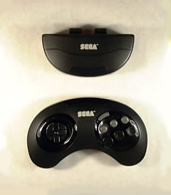 Moreover, the pads are just as durable and solid as you would expect a first party product to be, which is extra important for those gamers used to the smooth and quality construction of the standard Sega controllers. As I mentioned earlier, even though these pads are godly, acquiring a complete set will be tough. They where released in limited quantities and were really under marketed, so finding them is going to be a hassle. 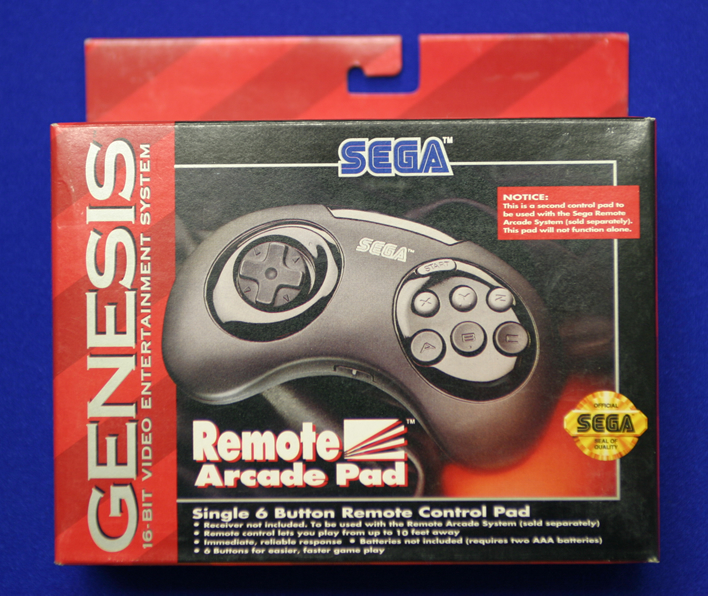 Back during the Genesis’s prime, I think I saw a lone set of these pads at an EB and forgot about them, due to bad memories of wireless technology circa 1994; I never cared much until 2006. A while back, Messiah Entertainment (the people who made the Generation Nex) listed wireless Genesis pads on their site as an upcoming product, but as of this writing, they have removed the reference from the site, and nothing has yet to appear. If they ever do come out, they should be worth looking into. Wireless pads for the Genesis that operate like Nintendo’s Wavebird would definitely be something worth getting. If you want to take the time to find the SRAS and spend the money, you are in for a treat. Price-wise, they don’t fetch a high price, due to a lack of demand and general knowledge that they even exist. When I bought my Remote Arcade System, I got one pad and the receiver for $4.99, and then a week later I saw the second pad and promptly bought it for $4.99. Occasionally, they will show up on eBay, I do not know of any other collector with these pads, and I have had a few people ask me about them. So I essentially got a complete set for $10.67, with sales tax. If you’re tired of the age-old hassle cables bring, do yourself a favor and hunt these down.